Haji Muhammad Ali started Student Biryani Cafe way back in 1969, after he set put a stall of aromatic flavor of rice which he called biryani at Katrak Road in Karachi, Pakistan. He began this venture with very few plates and a bucket of rice. However, the superlative taste of his biryani cast the spell on every patron, and with the passage of time his hard work started paying off and Student Biryani became a hit brand. Today Student Biryani has not only spread its network of branches in various cities of Pakistan, but it has also opened an outlet in Al Karama district of Dubai. The luscious taste and extensive menu of this brand enthralled the residents of Dubai too. Quick service and neat decor of this restaurant are quite impressive for the visitors. 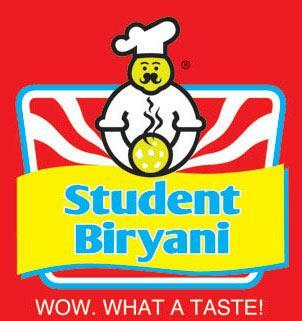 Above all, Student Biryani is offering all these services in exchange for very meagre amount. This fine feature has further help boost the popularity of this venue among people of Dubai. Student Biryani is well-known for its appetizing biryani that is prepared with traditional spices and fresh ingredients plus following a secret recipe, which was handed to the chefs of this restaurant by the owner Haji Muhammad Ali himself, who started this venture. Some of the famous dishes of this restaurant include karhai, bbq, kfc type fry chicken that is also offered in the form of bucket deals, and much more. With these fine attributes and carry out service, this Pakistani chain of restaurant has been able to make its mark in the city of Dubai as well. Student Biryani opens daily and activities begin at this cafe from noon and last till midnight. Kuwait Road - Dubai - United Arab Emirates. Head northeast on شارع الشيخ خليفة بن زايد‎/D 88, after getting out of this metro station and then turn right onto Kuwait Road. 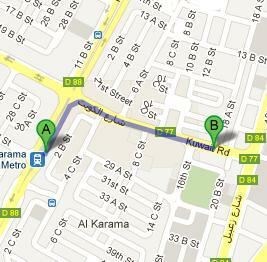 After covering some distance on this route patrons will find this eatery on the right side. Karama Ent. 2 - Dubai bus stop is adjacent to Student Biryani and bus numbers 33, 42, 44, 48, 83, 88 C3, C5, C14, C15 and C26 have stops at this bus station. Therefore, a person can easily reach near this bistro by taking any of these bus numbers. After arriving at this bus stop, passenger needs to cover just 8 meters gap which can bridged on foot in roughly 6 seconds, if he or she heads in the west course on Kuwait Road. View map for directions.